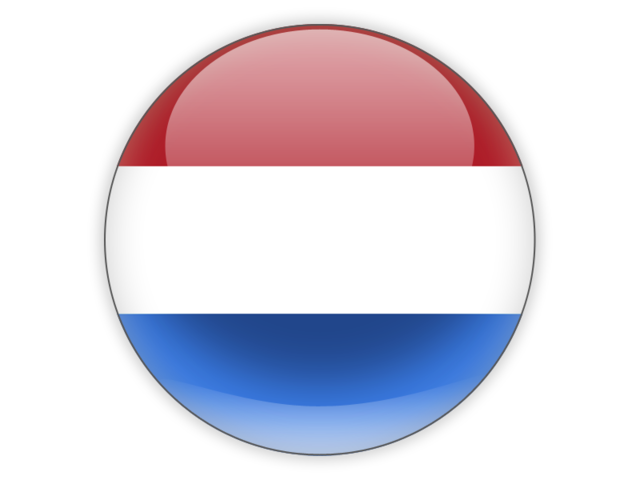 In October 2016 my brother Sammy De Backer told me that he would like to invest in my breeding loft. After a while, and some discussion, he decide to buy something out of "Golden Future" owned by Frank Zwiers and bred by Arjan Beens. We went to Breda, en bought "Golden Frank" a son to "Frankenstein" x "Golden Future". Son to "Narbonne Raket" x "Rood Meisje"
Won a.o. 1st nat. Brive 7105p in 2013 & 14th nat. Albi 5949p in 2012. Daughter to "Mr Bergerac" x "Rika" and full sister to "Olympic Miss Gijsje". Later that year, unfortunately "Rood Meisje" got lost on another race. "Golden Future" is a halfsister to "Olympic Miss Gijsje". 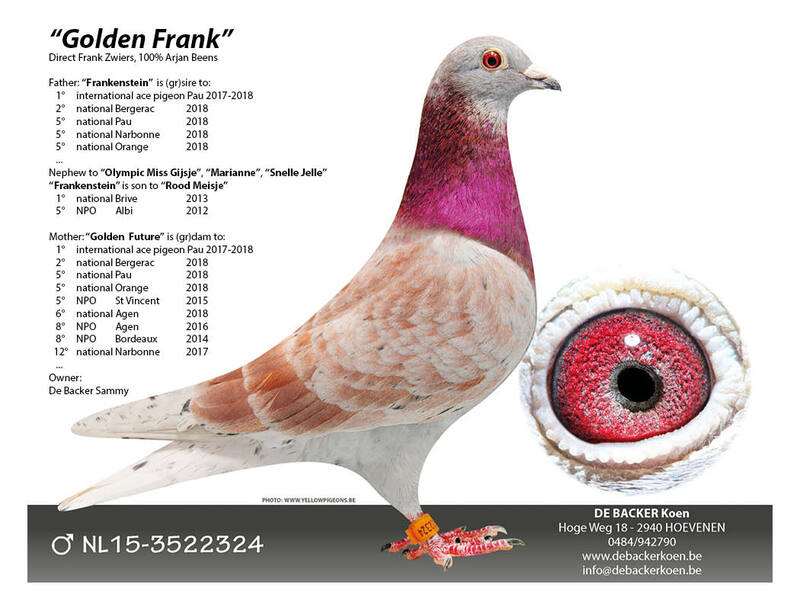 "Golden Future" is also halfsister to "Snelle Jelle", "Rood Meisje", "Marianne"
"Golden Future" herself is mother and grandmother to differt top racing pigeons at the Frank Zwiers loft. In the late 2015, I was looking for something extra to bring some new blood into my loft next to the breeders already at my loft. 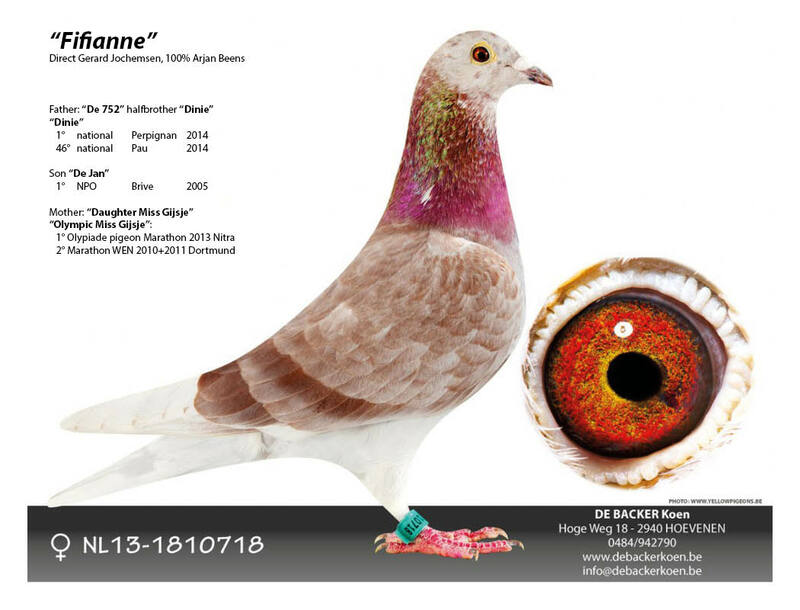 The Arjan Beens pigeons got my attention. 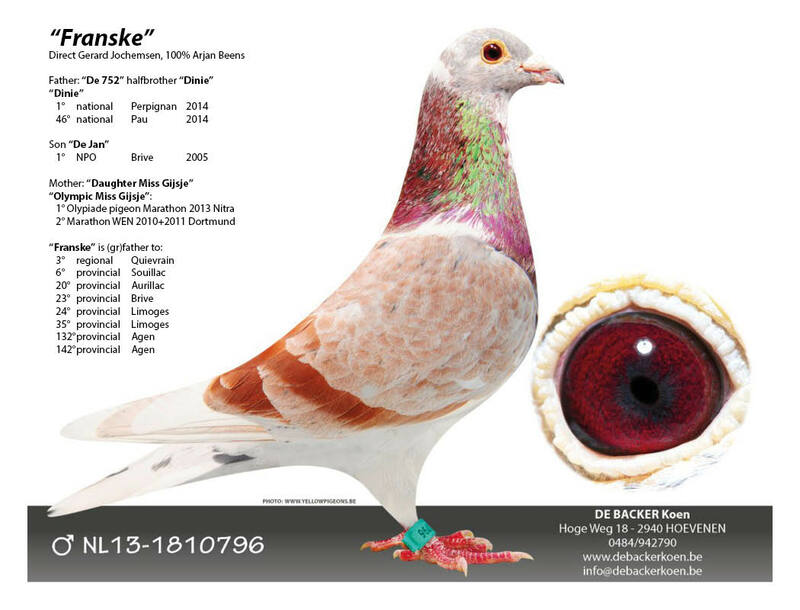 In the begin of 2016 I contacted Gerard Jochemsen and I bought some pure Arjan Beens pigeons, 2 grandchildren from "Olympic Miss Gijsje"
They are bred out of "De 752" x Daughter "Olympic Miss Gijsje"
The other hen of the "Rika" line is a.o. "Golden Future" bought by Frank Zwiers on the Arjan Beens total sale. "Rika" was paired to "Dancing Moonlight"
I'm very proud to have those grandchilderen "OMG" in my breeding loft.